My enjoyment of SEAT’s 1 litre Ibiza was marred by an act of automotive vandalism committed by an unknown perpetrator. On the way home from Wales Rally GB I stopped at Tebay northbound on the M6 for a wee rest break. OK, truth be told I stopped for one of their irresistible, meaty and succulent sausage rolls with the crisp pastry and a large tea. But while I was inside, the car was assaulted by a dirty rotter who struck my perfectly parked motor with his/her machine. No doubt it was one of those drivers who was on the phone, smoking a fag and holding a cup of coffee at the time while manoeuvring out of their position beside me. It looked like the edge of their turned wheel or front bumper had just caught the edge of the wheel arch, but it wasn’t just scraped, it had bent the metal. I didn’t notice this in the dark, but in daylight the next day I found it and knew instantly where it had happened because it was fine when I left Wales and there isn’t room in my driveway at home for someone to do it there! Naturally, no note of apology was left on the windscreen, far less a name and insurance details, leaving me to have to make the unfortunate and embarrassing call to those awfy nice folk at SEAT to tell them their car had been damaged. So I phoned Tebay and asked for the Duty Manager. She wasn’t available but the intention was to see if there was any CCTV above the main entrance because I was parked directly opposite the doorway. Anyway I passed on the details to SEAT who said they would follow this up. And that was the only downside during a busy week in Wales. Considering the amount of bumphf that I have to carry and the clutter that I collect while attending events, a roomy car is an essential tool in the working life of a roving rally reporter. 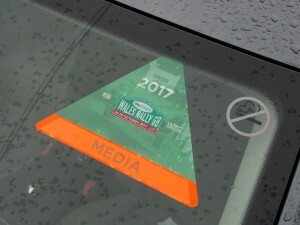 So when I found out that I would have the Ibiza for Wales Rally GB week I had visions of leaving it at home and taking my own car. What a pleasant surprise. 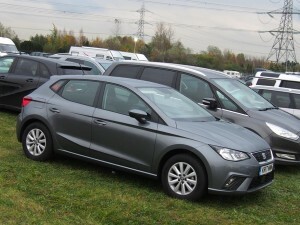 The new Ibiza is a lot bigger inside than the old model. It swallowed overnight bags, camera and computer kit, wet weather gear and dry weather clothing, sensible boots and brollies, flasks and sandwich boxes – and there was room to spare. Plans changed, I’d take the SEAT to Wales. There was another surprise in store. As is my wont I always have a wee drive in a road test car first before looking at the Spec Sheet and Technical Details. I set off on my standard 34 mile test route and had to pull over half way round to have a look at the Sheet. That was because I initially thought there was a 1600cc motor under the bonnet. It wasn’t. It was the new 1 litre turbo FSI petrol engine. This was the mid-range version with 94 bhp on tap, but it felt more. It really did, what a perky wee power unit, which made me wonder how the top of the range 114 bhp unit would perform! There is also a 74 bhp entry level engine, but I don’t know why anyone would bother with this because official figures show it offers poorer fuel consumption. On the other hand it has a much lower insurance rating so that might swing the buying choice, especially amongst younger drivers, and it has lower NOx emissions. But back to the 94 brake job. The engine is so good I wondered why it had only a 5 speed gearbox. On the long drag south (and back home again) I kept reaching for 6th gear. That wasn’t just down to habit, but an innate feeling that it could easily have pulled a higher ratio and improved fuel consumption figures further. SEAT reckon the car should average 60 mpg but the test average was 53 and that included two long stints cruising at no more than 75 on the Motorway. At no time did the car feel underpowered on the Motorway either. Overtaking required a couple of downchanges, nip out and back in again, and the wee one litre engine responded with gusto. It was even more fun on the Welsh country roads! Then again I don’t think this was ever intended to be a high mileage executive carriage, more a commodious urban runabout. 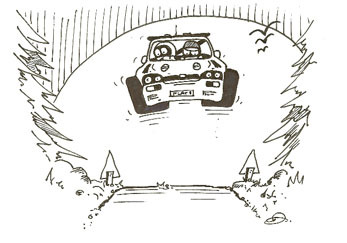 And yet it proved just as driveable on the local shopping run as the Welsh rally route hunt. 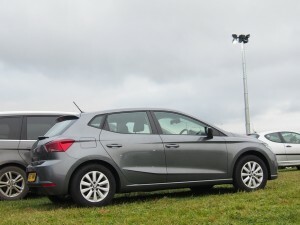 I don’t think the Ibiza could be called a small car because it was perfectly roomy for 4/5 inside and the driving position was ideal even for a tall driver. Enhancing the whole experience was the comfortable ride, nimble handling and crisp steering. The 1 litre SE is priced at £14,595 but it had nearly two grandsworth of extras including metallic paint, a DAB radio, Beats sound system with Apple/Android connectivity and ‘Media System Plus’ which incorporates a 5 inch touchscreen, USB, 6 speakers and steering wheel mounted controls. It also had the Driver Pack with Cruise Control and tiredness recognition system. This is a cracking wee motor, and yes, I would quite happily have one. Need any more convincing? My daughter has a Leon FR. And she has taste!